Hello students! 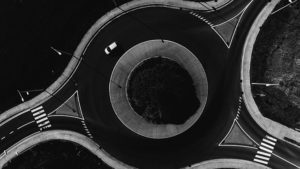 I’ve just gotten back from a road trip with my family – that’s a long trip taken by car – and I’m going to use this opportunity to teach you some vocabulary for driving and traveling by car. 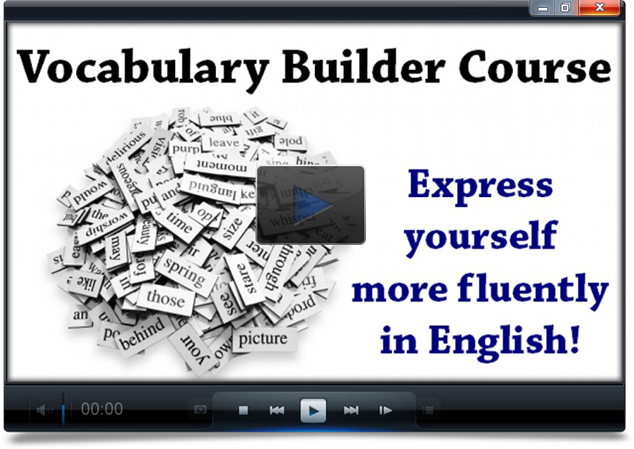 To learn more vocabulary that’s organized by topic, you can join my Vocabulary Builder Courses, which will teach you hundreds of useful words. We left early in the morning because we had already packed our bags the night before. To pack your bags means to put everything you’ll need for the trip (clothes, personal care items, etc.) into a suitcase or backpack. Most of our trip was on the highway. A highway is a wide road where cars are allowed to go very fast. 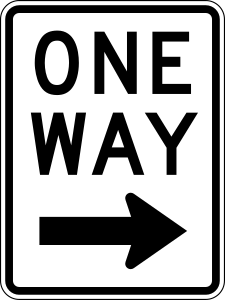 Highways have multiple lanes – a lane is a section of the road wide enough for one car. 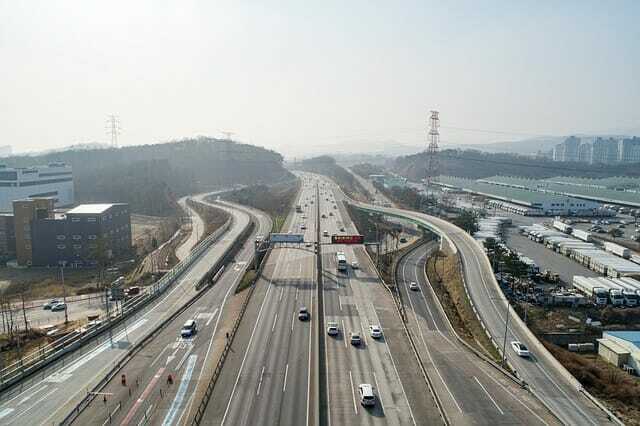 Most highways have multiple lanes, which are separated by painted lines on the road. In the first part of our road trip, we were making good time. This expression means that the trip is going well, without delays. Of course, we didn’t want to drive too fast, because then we might get a speeding ticket. That’s when the police catch you driving faster than the limit, and you have to pay some money as a penalty. When we crossed a bridge, we had to pay a toll. 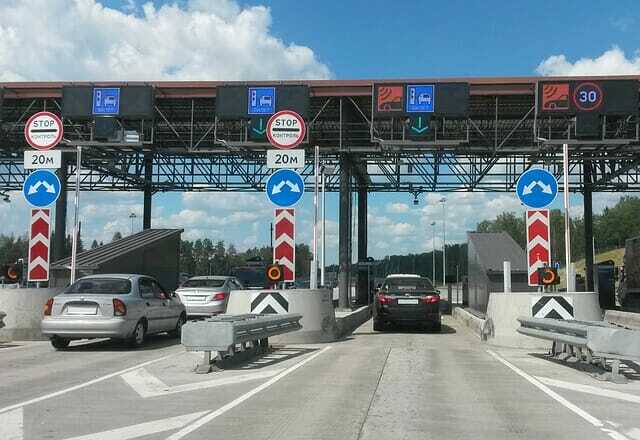 A toll is money that all drivers have to pay in order to drive on that part of the highway, bridge, or tunnel. 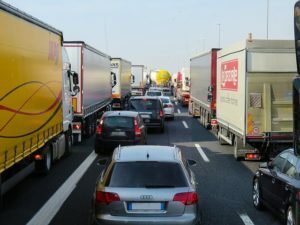 Drivers may need to pay a toll for use of the highway, bridge, or tunnel. We stopped at rest areas or rest stops several times during the road trip. These are places next to the highway where you can take a break from driving, use the bathroom, and sometimes get food or gas. Later in the trip we encountered bumper-to-bumper traffic. This expression describes when the traffic is extremely slow and almost stopped. The “bumper” of the car is the metal and plastic bar on the front/back of the car, which helps absorb the impact in case of an accident. If the traffic is “bumper-to-bumper,” it means the cars are traveling so slowly that their bumpers are almost touching. The reason for the bad traffic was an accident – a truck had hit a pothole in the road and lost control. 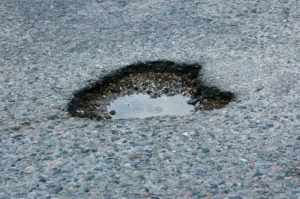 A pothole is a hole in the surface of the road. Potholes are dangerous for drivers. The truck and emergency vehicles were blocking two lanes, so all the rest of the cars had to merge into one lane. 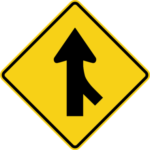 When talking about traffic, merge refers to when cars from a lane need to transition sideways into another lane (usually because the first lane is ending). Unfortunately we got a little lost when we got close to our destination. We took the wrong exit out of a roundabout – that’s a traffic circle with various streets going in and out of it. A roundabout has various entrances and exits. Cars only go in one direction around the circle. 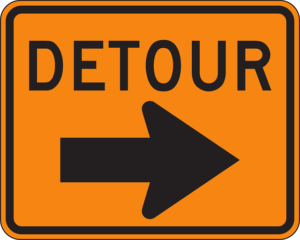 Then, when we finally got back on the right road, there was a detour due to construction – that’s when the cars need to take a different way because the main road is blocked for some reason. 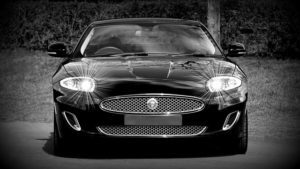 By the time arrived, it was dark outside, so we had to turn on our headlights – those are the bright white lights on the front of the car. Our friends’ house was on a one-way street – a street where traffic can only go in one direction – so we had to be careful not to pass it. If we passed their house, we would have to go around the block. The noun “block” is used to refer to a segment of a street between two other streets. We reached our friends’ house safely after the long road trip. I hope you’ll continue learning vocabulary with me inside my courses!